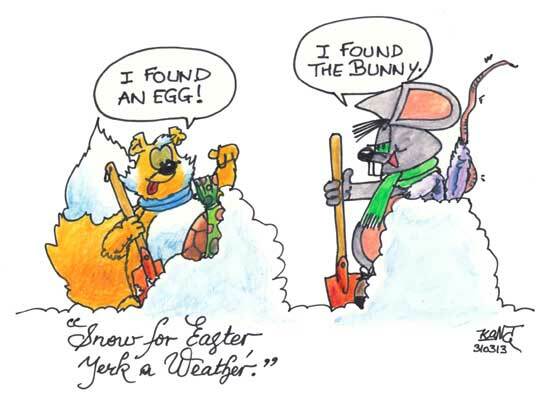 Fox & Ratty: Happy Easter! No, I'm not late! Not for every time zone and not if you're still at Winter Time. Snow? Yes, we had some the day before! I didn't see it but I was told from good sources... And it's a little over all Europe. Grmph. It's still Easter here! We had no snow, but it did rain. Thanks for the Easter drawing! It's good to see your pixels. We should have less than 0° at night (-17) in Paris area for at least one week more, with a NE wind. Brrrr.